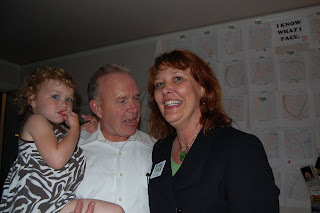 Mary Tuma has an article in the Community Impact Newspaper about Karen Sage’s impressive runoff victory over Mindy Montford in the race to replace retiring judge Charlie Baird (photo left with Karen at victory party) for Travis County District Court 299. Montford lost by a wide margin last night despite having come out ahead of Sage on primary day on March 2. The article notes that Montford had a lot of name ID because of her failed campaign in 2008 to become District Attorney in Travis County. During that earlier campaign she had received about $200,000 in donations from Dolph Briscoe and $1,000 from Republican Williamson County Attorney John Bradley, as well as a lot of other donations that allowed her name to become relatively well known to voters. From the onset assistant district attorney Karen Sage’s primary runoff election night party in downtown Austin bustled with high spirits as early voting totals, which showed the candidate up 16 percent, were announced at around 7 p.m. Staff, volunteers and supporters trickled in throughout the night to congratulate Sage for her consistent lead over challenger Mindy Montford, a criminal defense lawyer, at campaign offices on 10th Street. Former State Representative Ann Kitchen and Judge Charles Baird, whose position Sage will soon succeed, stopped by to join the party. “Karen is smart, ethical and hard working. The quality I know she has that will be very important in the court is compassion,” said Baird. Sage served as a state and federal prosecutor, civil litigation attorney, federal judicial clerk, assistant U.S. attorney and currently teaches ethics of criminal law at the University of Texas. As the sole mental health prosecutor for Travis County, she works to find alternatives to incarceration for patients who suffer from mental illness. “We need to start to look at the root of the problem, find some innovative solutions and break the revolving door of criminal justice for these patients,” she said. 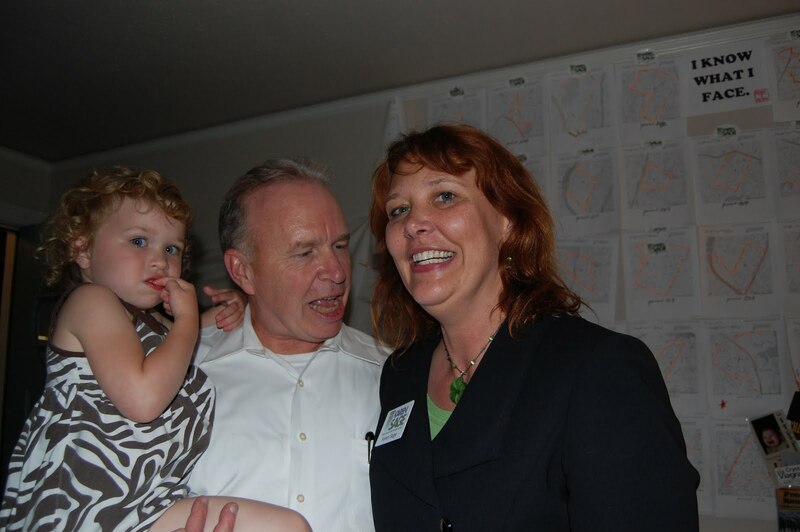 While Montford led in the primary election by roughly eight percent of the vote, Sage pointed to name ID (initiated by her opponent’s unsuccessful campaign for District Attorney in 2008) as a key reason voters may have initially opted for the fellow Democrat. This type of recognition, said Sage, carries a lot of weight in a down ballot race, as voters saw in March. Sage attributes her win to the door-to-door grassroots campaigning led by her team since June, a method she said is an unconventional approach to judicial races. The candidate employed four full-time field operators, a manager, director and several volunteers. Campaign Manager Jim Wick noted the race produced no staff turnover and hired no major political or fundraising consultant. Sage said she has personally spoken with 10,000 voters over the course of the campaign, either in person or over the phone.